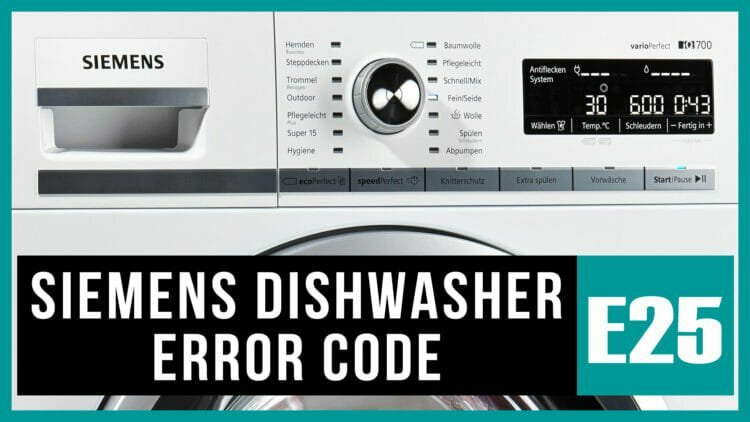 If Siemens dishwasher shows the E25 error on the display, it informs the user of a system malfunction. This time, the dishwasher does not drain water. In the instructions for the dishwasher, the decoding is as follows: the drain failure. Drain pipe or pump clogging can cause the error code. The impeller may be blocked, so draining does not occur. Often, food debris, small bones, toothpicks, napkins, and shards of dishes can lead to the failure. These objects block the work of the impeller. Even if you carefully clean the plates, but never clean the drain, a fat plug can form. As a result, water will not pass through the nozzle, so the system can show the E25 error code. If the icons appear on the screen again, then it’s not a software failure. It is about a technical malfunction. With the help of a sponge or other means, drain water from the pan. Unscrew the drain filter. Rinse it under the pressure of water. Remove the screws securing the pump cover. Pull the damper towards you and remove. Clean the impeller from the litter. Disconnect the equipment from communications and electricity. Move to a more spacious place and drain water (if it has left). Turn the machine over the back and remove the bottom. Loosen the clamps and disconnect the drain hose and hose. Clean the parts under the water pressure. If the pump impeller breaks, you can replace it at home. But if the winding has burnt out, then you need to completely change the element.